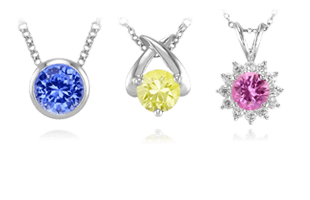 Sapphires have an extensive history throughout cultures around the world, with a storied presence both at court and in literature. 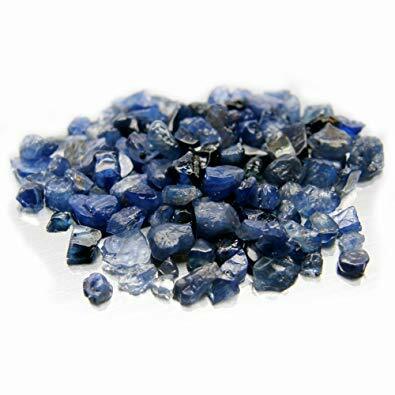 Throughout time, sapphires have been revered for their beauty, their strength and durability, and the perceived powers of wellness and protection. 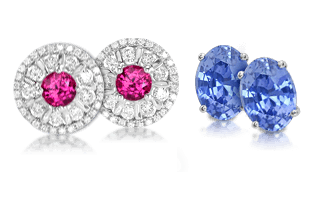 In a celebration of the special cultural relevance of sapphires, we have gathered together some of our favorite stories to share of historical sapphires through all cultures. Helen of Troy painting by Evelyn de Morgan (1898). Helen of Troy – 12th century B.C. According to legend, Helen of Troy owned a large star sapphire, which was believed to hold the key to her desirability. According to Apollodorus, she had at least thirty suitors vying for her hand. Although she married King Menelaus of Sparta, she was abducted by Paris, an act that led to the Trojan War. Perhaps the beauty that “launched a thousand ships” owed it all to the allure of sapphires. 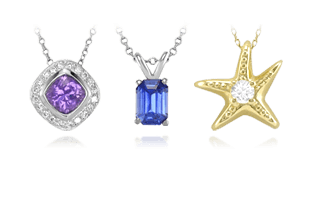 It is not often that star sapphires are seen at the center of such a legend, but their beauty and mystical appeal is unmatched. The stones are said to impart deep spiritual enlightenment and inner peace on those they touch. It is no wonder that if Helen of Troy was in possession of such a stone that it would be seen as incredibly powerful. King Solomon – 1000 B.C. 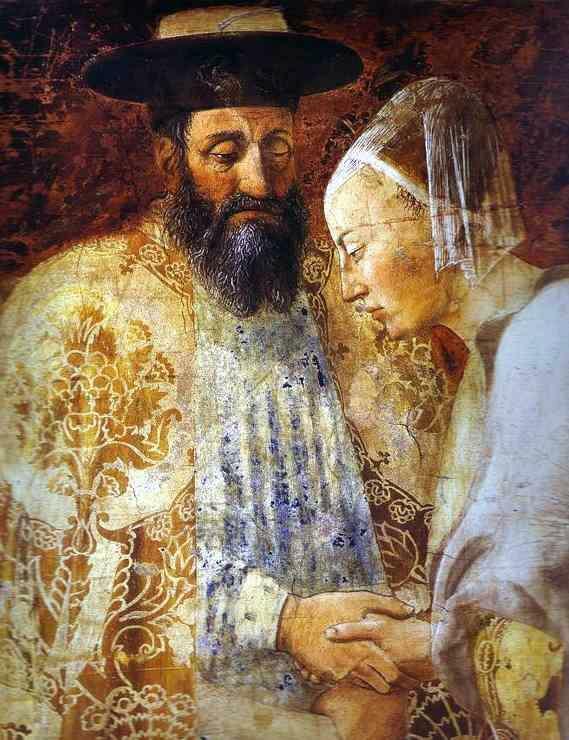 The Queen of Sheba Meeting with Solomon in a Piero della Francesca painting. In Medieval Jewish, Islamic, and Christian legends, King Solomon had a magical ring known as the “Seal of Solomon.” According to legend, it was an inscribed sapphire, which gave him the power to command demons and speak to animals. Although it was purportedly inscribed with a hexagram or “Star of David,” it is not hard to imagine that it may have also been a magical six-pointed star sapphire. King Solomon is said to have used the magic of sapphires from the island of Sri Lanka to seduce the Queen of Sheba. A portrait of Charlemagne painted by Albrecht Dürer several centuries after Charlemagne’s death. The coat of arms above him shows the German eagle and the French Fleur-de-lis. Charlemagne is also depicted wearing the Crown of the Holy Roman Empire. Charlemagne, the founding father of France and Germany and the first ruler of the Western European Empire after the fall of the Roman Empire, was an intensely religious man. To Charlemagne and his contemporaries, sapphires symbolized heaven and the promise of eternal salvation. Charlemagne owned a sacred amulet in which a relic of the True Cross was placed between two sapphires. The amulet was buried with Charlemagne in 814, but exhumed about 200 years later by Otto III. Empress Josephine, wife of Napoleon, wore it at her coronation in 1804. Later it passed to Napoleon III, and on his death, his widow gave it to the Archbishop of Rheims. 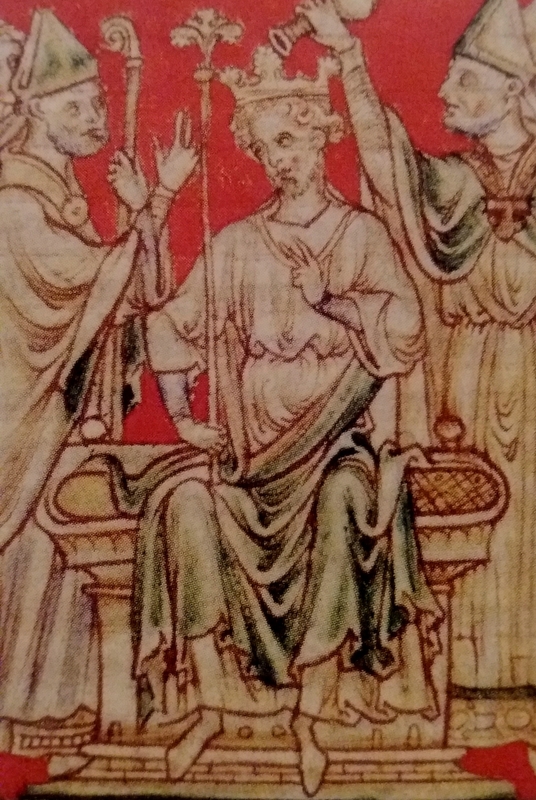 A drawing of Richard I from a 13th century manuscript. According to some sources, Innocent III also gifted four gemstone rings to Richard’s successor, King John of England, at the end of their long power feud. Apparently after many years of squabbling, the two reached an acceptable compromise: power was yielded to the former and tribute or service money granted to the latter. As part of the truce, Pope Innocent III forwarded a gift of four gemstone rings, each containing a single emerald, sapphire, ruby, or opal. Although the rings do not survive, the letter that accompanied the gift does. In it, the Pope instructed the King to allow the inherent “virtues” of the stones to guide him in his daily life, as they represented faith, hope, charity, and good works, respectively. 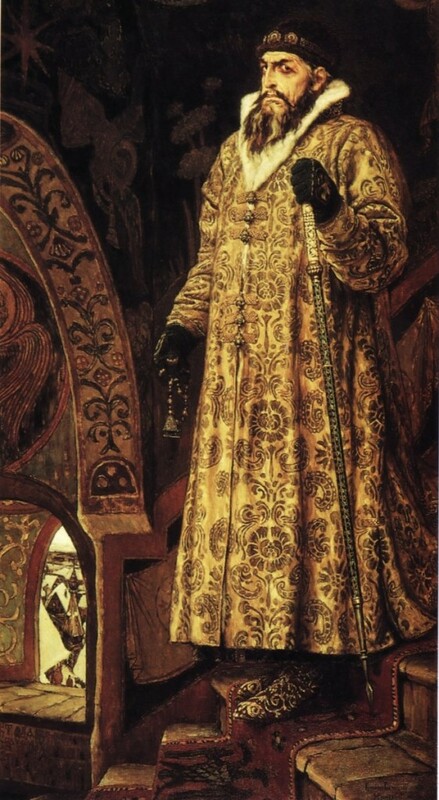 A painting with the likeness of Ivan the Terrible. The sapphire I greatly delight in, it preserves and increases courage, gives the heart joy, is pleasing to all the vital senses, and it is precious and sovereign for the eyes: it clears the sight, takes away bloodshot and strengthens the muscles and strings of it. There are a number of rumors surrounding Ivan’s demise, including death by mercury poisoning—which does not say much for sapphire’s legendary ability to neutralize poison. A portrait of Rudolf II. The court of the Holy Roman Emperor Rudolf II was filled with alchemists, lapidaries, and artists who wielded considerable power. Although Rudolf II was not a good leader, he was reportedly a decent painter and lapidary. He was also taken with mysticism and assembled a league of astrologers and physicians to counsel him on the healing and occult powers of gemstones . His extensive collection of gemstones and exotica included mermaid teeth, unicorn horns, phoenix feathers, and nails from Noah’s Ark. Gemmarum et Lapidum historia by Anselmus de Boodt. Shah Jahan standing on the globe of the world. The name of this Mughal Emperor means “King of the World” in Persian. He, like many of the other Mughal emperors, was an avid gemstone collector. He is perhaps best known for building the Taj Mahal as a tomb for his beloved wife, Mumtaz Mahal. He is less well known for commissioning the famous Peacock Throne described by Jean-Baptiste Tavernier (1676) in his travels to India. According to Tavernier, the marvelous throne was everything legend declared it would be. The Peacock Throne featuring jewel-encrusted peacocks. It required some seven years to construct, and derived its name from two enormous peacocks that stood behind it, tails spread and encrusted with blue sapphires, emeralds, rubies, pearls, and other precious stones. 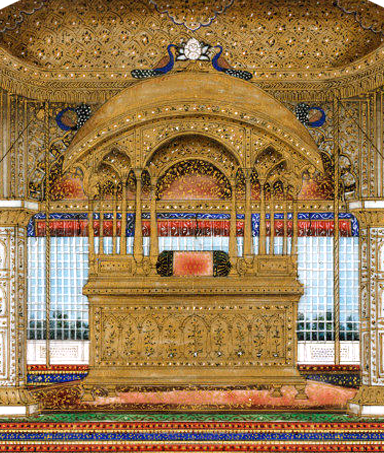 The famous Koh-i-noor diamond was originally placed in the throne, which was shaped like a bed or dais. Catherine II of Russia was known as an enlightened despot. She became Empress after a bloodless coup deposed her husband, the eccentric Peter III. Under her rule, the Russian Empire grew by some 200,000 square miles. A portrait of Catherine the Great. Like her predecessors, Ivan the Terrible (see above) and Peter the Great, she had a great love for gemstones. She was fond of decorating entire rooms with stones such as agate, jasper, marble, malachite, and porphyry. An admirer gave her a magnificent 337-carat sapphire, which remained among the Romanoff jewels until it was sold by Nicholas II to finance a hospital during World War I. “Catherine the Great’s Sapphire” later became part of Harry Winston’s celebrated “Court of Jewels,” but it is now owned by a private party. A painting of Napoleon Bonaparte. Joséphine was a widow and mistress to several prominent political figures in France until she met Napoléon and their tempestuous love affair began. Soon after their wedding in 1796, Napoléon left to lead the French army in Italy, where he became a collector on a truly imperial scale. So much art, sculpture, and jewelry were looted from the Italians that they gave him yet another title, Il Gran Ladrone (The Great Thief). It is said that Napoléon lavished Josephine with jewels–many of which were the spoils of his military campaigns–but others believe he was a reluctant provider, as he frequently and bitterly complained about her excessive spending habits. We do know that both the Emperor and Empress maintained fabulous collections of gemstones. 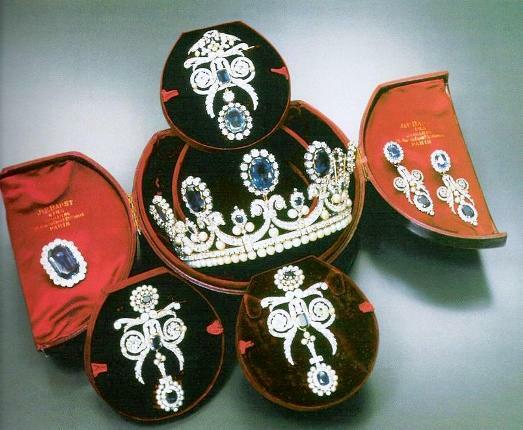 One of Joséphine’s favorites was the parure of Queen Marie Antoinette, a seven-piece jewelry set containing approximately 29 sapphires—many larger than 20 carats. The Parure of Queen Marie Antoinette. A portrait of King Mindon. The penultimate ruler of Burma (now Myanmar), King Mindon, was considered an able and just ruler, but he was also obsessed with rubies and sapphires from the legendary Mogôk Valley. When King Mindon moved his capital to Mandalay in 1859, it is said that he buried a trove of precious sapphires and rubies under the foundations of his new palace to appease malevolent spirits called nats. Such was his obsession that King Mindon ordered samples of gem gravel shipped from the Mogôk sapphire mines hundreds of miles away so he could personally sort the material in the palace courtyard, eyes peeled for rough sapphires and rubies. A selection of rough sapphire crystal such that King Mindon would have inspected. He taxed the gem trade by confiscating stones over a certain size and quality. He also taxed sales at the Royal Gem Bourse in Mandalay after it was established in 1866. Any miners caught smuggling or otherwise cheating the crown out of its “royal stones,” could pay with their lives. After the death of King Mindon, King Thibaw, the last ruler of the Konbaung Dynasty came to power amid great scandal and intrigue—including two ghastly massacres that eliminated all other contenders for the throne, their allies, and their families. A photograph of King Thibaw wearing some of his gem-encrusted regalia. At ceremonial affairs and in a number of photographs King Thibaw wore splendid gem-incrusted regalia including a “sapphire ring worth a monarch’s ransom.”King Thibaw was a profligate spender who incurred great debt despite Burma’s enormous natural bounty. Under King Thibaw’s reign, conditions in the Mogôk region deteriorated as the miners were increasingly taxed and repressed. When the British invaded Mandalay in 1885 and forced him into exile, the royal treasury and countless jewels mysteriously disappeared, despite the fact that they were entrusted to the British Chief Political Officer, Col. E.B. Sladen. Today, we can only imagine the tantalizing items described in the official inventory. 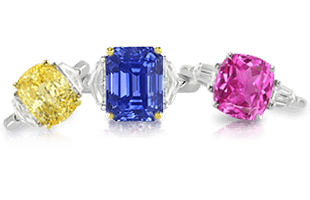 No comprehensive coverage of famous and historical sapphires would be complete without a discussion of British royalty. We explore that history next in The British Crown Jewels and Queen Elizabeth II | British Royalty’s Love of Sapphires.